I teach on a range of courses, including professional, postgraduate and undergraduate. I teach digital transformation and digital marketing to accountants on the ACCA. For the MBA I teach information systems strategy and scholarly research methods. I really enjoy this module, the students have a very wide range of work experience and we draw on it during four full-day workshops. I teach digital marketing to postgraduate and final year undergraduate. It is a very stimulating topic to teach, it changes very rapidly, and my undergraduates produce really well-researched blog posts which I like to share here. From October 2018 I will be leading a new module on digital transformation for first-year Business undergraduates. I am excited, it is a long time since I taught first years, and I know there is a real dynamism in working with those who are new to higher education. I see it as a chance to build a sense of excitement in them about the possibilities of technology to change their lives, the world of work and how the world works. Technology is so fundamental to what makes us human, but also is deeply problematic, exacerbating some of our worst tendencies. I hope this new module will get us engaged with what a good business education is from the get go. I have been fortunate enough to have had a varied range of work experiences. I really enjoy doing work physically as well as more cerebral work, so some highlights include the seven years I was a butler. I learnt a lot about good clothes in those years and like to think I still mix a mean cocktail. I ran a comic shop for several years in central London, there is a real buzz in fandom that I miss. People who conduct research about the history and details of comics and science fiction, to publish it in fanzines taught me much of the joy of serious scholarly work. I built websites, and e-commerce systems during the heady dot.com years of the late 1990s, which was very exciting. That experience still gives me a feeling of deep understanding of how the internet works. My highlight was starting Gamespot UK. In its time it was a very popular site and we established an innovative and award-winning approach to online publishing (PPAi 2001). Technology is what makes us human. The application of digital technology and networks by society really excites me. There is such potential for deeper understandings and deeper connections, yet also an enormous risk. The implications of digital transformation have fascinated me all my adult life. As part of the Digital Transformation Research Group I try to make sense of the changes that are happening. I think this interview with the BBC gives a sense of how excited I get when asked to offer an analysis of how digital is changing the ways we learn about, work in and organise our world. I am conducting economic sociological research into how graduates use social media as they seek work, as part of a PhD I am undertaking, focusing on the cultural and creative industries. I am finding it immensely rewarding and exciting, to spend time talking with graduates to see what they are doing after university. The relationship between work and learning are so crucial, and I have enjoyed researching the history of how the fully functioning universities have contributed to work, learning and society. I am also looking towards the future of work and learning through my research into what I call New Vocationalism. My work is not all about scholarship: I try to get outside and connect with a physical world. Walking my dog, eating good food, traveling to dance and to see art whenever I can. At least a few nights a year I like to sleep by a fire on the ground in my tipi, with the stars visible above. 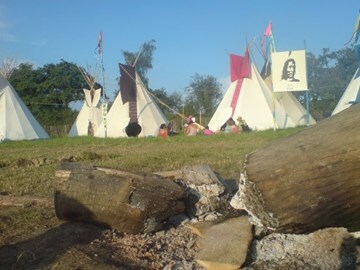 I have been a firekeeper in the tipi field at Glastonbury festival for the last 25 years. Here is a precise poem by the Rowan McCabe the door to door poet, about how hard moving the big logs can be.